It is understandable that such a tradition is documented on disc. The booklet doesn't mention any previous recordings; it would surprise me if no previous performance had ever been recorded. One would expect that at least some performance under Ericson's direction had been recorded. There certainly will be many people who have attended one or more performances who would like to have one of them on disc. However, whether such could compete with the large number of recordings which are available on the international market is a different question. 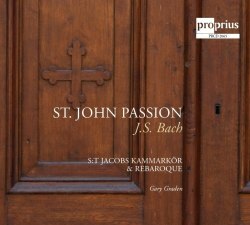 There can be little doubt about the qualities of the St Jacobs Chamber Choir; its recording of Bach's motets was given a positive review by Dominy Clements. With its more than thirty singers it produces a remarkably transparent sound and the text is quite easy to follow. That said, this size is not ideal for Bach's passions. Especially problematic is the balance between choir and instrumental ensemble. REbaroque plays with one instrument per part, and in the tutti episodes that results in them having too little presence. Some of these features are also present in the singing of the other soloists. Håkan Ekenäss is rather disappointing in the role of Jesus. He doesn't radiate much authority and his singing is marred by a consistent slight tremolo. Because of that his arias also make little impression. Lars Johansson Brissman is very good in the role of Pilate. Mikael Bellini has a beautiful voice, but is not that powerful. The A part of 'Es ist vollbracht' is exquisitely sung, but when it comes to proclaiming Jesus' victory (Der Held aus Juda siegt mit Macht) he apparently is not able to raise his presence. 'Von den Stricken' is not unproblematic either, because his voice is somewhat overpowered by the two oboes. The two soprano arias are the best of this recording. I had never heard of Jeanette Köhn, but I am impressed by the way she sings here. Her articulation and diction are perfect, and she gives fully idiomatic and stylishly convincing interpretations of these arias. To sum things up, this is a very respectable performance, and I can fully understand that people flock every year to the performances in St Jacob's Church. The dramatic character of this passion is very well conveyed. However this performance from 2011 has a couple too many weaknesses to stand up to the competition of the best.